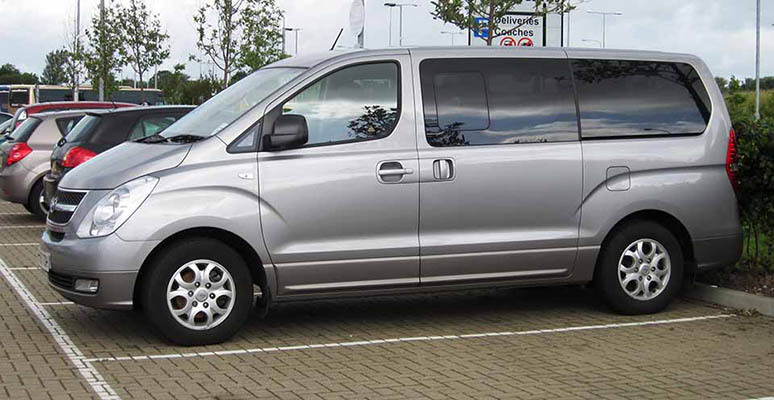 Minibus Hyundai Starex has a modern look, equipped with a pleasant interior, technically safe. The bus has proven itself as the perfect vehicle both on the streets and out of town – on the tracks. The main advantage of the minibus: comfort, good driving performance and excellent technical characteristics. The cabin has everything you need for your comfort. Thanks to modern large chairs, air conditioning system, audio system, beautiful interior, good finishing of interior and sweeping views from the windows, you will feel comfortable as at home. The cabin has enough space in order to passengers feel comfortable. Also the cabin has plenty of space for luggage. Third yard of cabin formed, which is very convenient, because once it becomes more space. The second row seats to rotate, which creates additional convenience. The minibus has high seating position and four-wheel drive, which creates additional benefits on the road, because the size of buses plays a significant role on busy highways and roads. Among other minivans, the model has the optimal dimensions. Bus demonstrates its driving performance. The bus can go even on not paved road. Hyundai Starex is equipped with airbags and ABS system. The design of minibus is well thought out and durable.